Strong essential questions can focus a music lesson or spark an animated discussion. They can also help you make sure that your lessons address the National Core Music Standards. Generating these big questions and phrasing them in student-friendly language takes lots of reflection and thought, and even great teachers don’t always have enough time to create them. 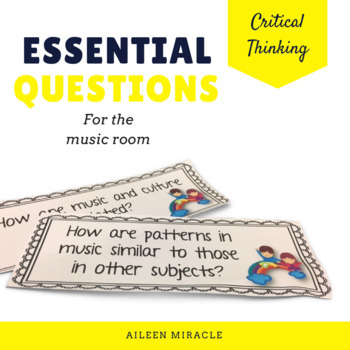 Essential Questions for the Music Classroom provides 28 essential questions in accessible formats that you can begin incorporating into your classroom immediately. Teachers who are working to incorporate National Core Music Standards into their lesson plans have found these questions especially helpful, as the checklist demonstrates which questions address which standards. And, if you aren’t sure how to use essential questions, or are looking for some new ideas, this bundle provides several suggestions. Whether you print and laminate them or display them electronically, these questions will help both you and your students grasp the big ideas that are essential to their music education.